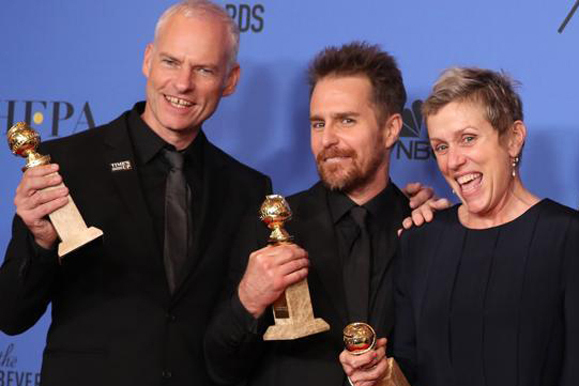 Martin McDonagh, Sam Rockwell, and Frances McDormand with their 2018 Golden Globe Awards for McDonagh's Three Billboards Outside Ebbing, Missouri. The 2018 Golden Globe Awards were a smash success for Irish names in the movie business, with Saoirse Ronan winning Best Actress in a Motion Picture – Musical or Comedy for her starring role in Lady Bird, and Martin McDonagh’s Three Billboards Outside Ebbing, Missouri picking up four statues, including Best Movie – Drama. McDonagh himself won for Best Screenplay, and the film’s two top actors, Frances McDormand and Sam Rockwell, both won for Best Actress and Best Supporting Actor – Drama, respectively.